In Greece, where people have been on the receiving end of severe austerity measures and lived through six years of recession, it’s a question that politics, as we know it, seems incapable of addressing. The Greek government may have succeeded in imposing the spending cuts required by the IMF and Eurozone countries to secure financial bailouts, but changes have been set in motion that are rarely measured when it comes to determining economic policy. 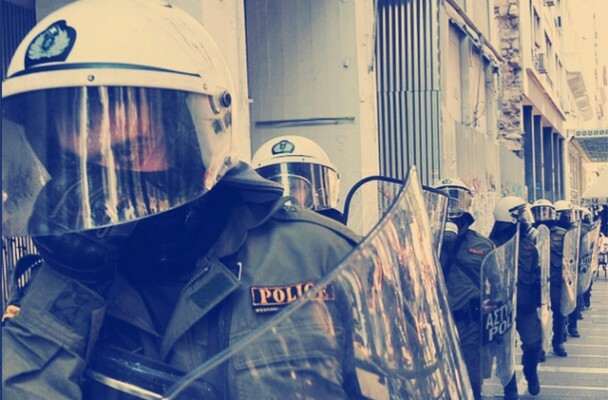 So to an outsider, today’s (20 February) general strike in Greece might look like just another in a long line of protests, but to many Greeks it will feel very different to those that took place in the years immediately following the debt crisis in 2009. The austerity measures have been presented as unavoidable, but growing unemployment, cuts in salaries and pensions to name just a few of their effects, have had an impact on Greek people that is difficult – and uncomfortable – to comprehend. Not only should we be concerned about the actions of an increasingly authoritarian government and the advance of far right extremists, the crisis facing Greece must surely prompt questions about how people might respond in the face of a failing political and economic system. Amid a growing sense of hopelessness and despair – and fear – it’s unlikely that the union organised strike will attract anything like the numbers matching the half million who turned out in Athens during the the October 2011 protests. Even if the strike succeeds in shutting down state services for a day, the optimism and organisations that formed spontaneously in the city squares during those early protests are largely gone. “There is too much repression”, says Oikonomides. “During the sit ins, it was something entirely new. You had thousands of people spontaneously answering a call by other citizens, not by unions or political parties. But it’s when you had this unstructured movement developing when the repression was most fierce. We had the hell beaten out of us”. It’s not only fear that’s keeping away, however. Uncertainty in every sphere of life means that people lack the motivation to take part in demonstrations, or be involved in building alternative structures. But with no end to the economic hardship in sight, where can the Greek people find hope? The continuing work of the assemblies that were formed during the demonstrations across Greece two years ago, the creation of bazaars where people can exchange items or give them away, a worker takeover at Viomichaniki Metalleutiki (Vio.Me), a building materials factory in Thessaloniki, may be positive that a shift is taking place, says Oikonomides. The thousands of people flocking to see Our Great Circus, a play staged at Thessaloniki’s National Theatre of Northern Greece, suggests there is a desire for experiences that unite people, says Oikonomides. “People have stopped going to the cheap, show-off shows and instead are going to see plays and concerts, perhaps because they don’t have a political colour, but like Greek music, it’s something that everyone can appreciate”, says Oikonomides. As many Greeks experience desperation that conventional politics, and certainly politicians, seem unable to challenge, then perhaps small, simple creative solutions are needed.